Karthwasten Hall is a farmhouse in the southeastern part of Karthwasten, located next to Enmon's House. It is the home of Ainethach, the owner of Karthwasten's mines. It consists of one zone, Karthwasten Hall. The front door opens to a bedroom area on the right and a kitchen and dining area to the left. Immediately to the right is a single bed (belonging to the KarthwastenAinethachHouse faction) in the northwest corner. Farther along the west wall is a small table holding five gold coins, five silver ingots, and a medium-sized coin purse. A non-respawning wardrobe stands along the south wall nearby, next to a woven basket containing two potions of vigor. A double bed, owned by the same faction, is situated to the left, with a small non-respawning chest at its foot. To the left of the bed is the home's fireplace, with a steel mace on its mantel and a cooking pot at its base. A hanging rack with three freshly caught rabbits can be found just to the left of the fireplace. The east side of the north wall hosts the dining and food storage area, starting with a large dining table. The table is set with two loaves of bread, one bottle of wine and two bottles of alto wine, three pine thrush eggs, a potato, a serving of salmon steak, a head of cabbage, and two bottles of Nord mead. On the floor next to the table is a woven basket containing two leeks, and a set of shelves which hold two more leeks, three potatoes, and a garlic bulb, as well as some sliced eidar cheese, an eidar cheese wedge, and a goat cheese wheel sitting on top. 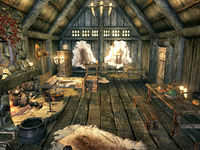 Above the shelves are several hanging ingredients, including two garlic braids, three portions of dried elves ear, and some dried frost mirriam. A respawning food barrel can be found in the northeast corner. Heading downstairs will lead to the basement, which is relatively bare. A garlic braid and one portion each of dried frost mirriam and dried elves ear are hanging above a small round table which holds a single loaf of bread. A set of shelves on the south wall holds various kitchenware, and two respawning food barrels sit to the right. A training dummy stands near the center of the west wall with a non-respawning large sack nearby. A long work table sits against the north wall near the stairs, holding nothing except a medium-sized coin purse, and another respawning food barrel rests to the right. The front door has a novice lock, the key to which is carried by Ainethach. 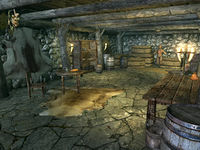 Two respawning food barrels can be found next to the steps to the porch, which hosts a tanning rack, six more respawning food barrels, and a table holding four bottles of Nord mead and two loaves of bread. If you marry Ainethach, you will have the option of living here. This page was last modified on 5 September 2014, at 04:21.